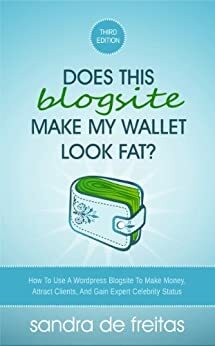 Does this Blogsite Make My Wallet Look Fat? Is a jargon-free, step-by-step guide for anyone who wants to build their own blogsite (blog + website) to make money, attract clients and gain expert celebrity status. Who doesn't want that? The author took a complex subject and made it simple and enjoyable. I was able to understand and actually do Sandra's suggestions. Unlike so authors who only share the how, Sandra offers the reader strategy about why a choice might be better than another. This is how you build lasting knowledge. Whether this is your first or fourth Wordpress blog, this is the book for you! This short book has a wealth of knowledge for the novice Wordpress website builder. It includes links to key WP Codex sections, and has step-by-step instructions for many key procedures. I feel much more confident in diving into Wordpress than before I read it! Thanks, Sandra, for a great resource! 5.0 out of 5 starsHave All 3 Editions! If you are online and wanting to keep ahead of the 'blog' game ... then this is a must read!